Notes: Based on a manga by Yuki Midorikawa, who is most famous for creating Natsume's Book of Friends. The manga consists of four mostly unrelated stories, only one of which appears in this film. Hotaru, a young and playful girl, finds herself lost in a forest purportedly inhabited by spirits while spending a summer at her Uncle's countryside house. A mysterious and masked young man named Gin, who claims to somehow "no longer be human", finds her, and in spite of his claim that he will disappear should she ever make contact with him, he agrees to lead her out of the forest. Before the day ends, however, the two find themselves enjoying each other' company and agree to see each other again, in spite of the risk Hotaru brings to his life and her fear that as she grows older each summer, she may someday cease to be able to be with him. I do sometimes think that American audiences could do to rethink their definition of a "children's movie". Far too often, I find that when a film is deemed "appropriate for all audiences", it simply feels blandly harmless and impotent, whereas the films that sell well are often those that simply cover up their storytelling inability with special effects, gunfights, and cliched characters touched up with enough gimmicks to incite the kids to turn their attention from one franchise to another. When I think about this phenomenon, I find myself thinking of the likes of Hayao Miyazaki and his willingness to direct films that won't send children recoiling in horror and yet might give them something to think about as well, and with the 2011 film Hotarubi no Mori e, I've discovered something of a peer to his films. Courtesy of the same mangaka and director that brought us Natsume's Book of Friends, it is a gentle tale that blends beautifully animated scenes of leisurely pleasure and yet complements those scenes with a bitter if not strictly "dark" undertone, progressing in heaviness just as the main character progresses in age and telling a surprisingly deep story as a result. Regardless of the character's ages, there is one thing in particular that stands out about this movie, and that is that Hotaru and Gin are wonderful to watch. As a child, Hotaru is of the adorably naive and inquisitive type who, upon being told not to touch an object, can think of nothing besides doing the exact opposite, and yet she fails to be either whiny or frustratingly impotent, being the sort of toddler you look forward to watching grow up. The movie, in fact, is told mostly as flashback from the perspective of a teenaged Hotaru and shows her aging from a toddler to a high school student, neither skimping on the in-between points nor rendering her unrecognizable as time passes. She's lovely to watch both as a child and as a developing adult, in fact, and while collecting my thoughts on the film, I realize that such consistency of characterization even across age differences is impressive for such a short movie. Gin's presence, meanwhile, brings a welcome degree of weight without bringing angst or unnecessary drama about: even in his moments spent leisurely flying kites and wandering the deep forest paths with her, there is something sad about his presence. Indeed, covering his face with a mask amplifies his outward mysteriousness and position as someone whom a parent might be suspicious of their child meeting (for after all, hearing that one's little girl was playing with a strange teenager in the park would be cause for at least a little alarm) and yet contrasts with his kind intentions, genuine interest in her company, and, really, the fact that he has a basic desire for companionship just as any human does. I felt that the film effectively opened him up to the audience at a good pace, giving the viewer an occasional glimpse of his unmasked face and equipping him with a snarky if not cruel sense of humor that made him all the more likable as a character. The two do change as Hotaru grows older, as well, and while I was initially apprehensive that the movie might bungle their relationship as friendship developed into more than such, it portrays them as matured people whose companionship has correspondingly evolved, maintaining the breezy atmosphere and yet carrying itself as an inherently more complex story as one character has gone to a point where she must think about the limits on her affection and the other has become more comfortable while still being unable to alter the fundamental problem of his condition. Hotarubi no Mori e is, atmospherically, a gorgeously detailed piece with beautiful animation courtesy of Brain's Base studio, a landscape beautiful enough to make me regret being barred from it by the difference between fact and fiction, and a nostalgic feel brought about by such moments as Hotaru's uncle recalling a period spent in the woods from his own childhood and her dreamily recalling her summers spent there while gliding by the countryside on a train. It's a story that could easily become trite, but with the strength of the script and characters, as well as the artistic detail that brings even a visit to a summer festival (which must show up in at least 85% of all anime set in present-day Japan) far from banality. The appearance of the show, mellow in tones and soft in shape, suits the story well, as does the leisurely pacing and a score that is understated almost to the point of being absent. The few flaws are, by-and-by, inconsequential but still difficult to ignore, among them that the designs of some of Gin's "fellow spirits" seem ill-suited to the rest of the movie (with a few being awkwardly cartoonish) and that a key plot development at the end is brought about by arbitrary means. 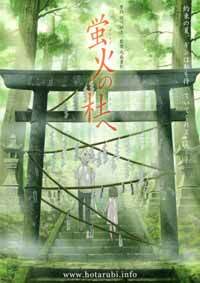 And while Hotarubi no Mori e is nicely self-contained, there was, at the end, a lingering desire to see more: although I am not sure where such additional material might have gone, there was such magic to the tone of this movie that 44 minutes seemed somehow inadequate. Nonetheless, this vignette of bittersweet nostalgia makes for a worthwhile and thoroughly enjoyable experience, showing that a good cast of characters, a strong script, and the correct sort of emotional development can make a movie work just as much as an "original" story may. Hotarubi no Mori e is, in my opinion, perfect for both those adults who wouldn't mind a little leisure in their lives as well as those children who can appreciate the fact that all stories need not be entirely happy without equating a serious plot with violence. It's the sort of movie that probably won't ever sell well for the exact reason that its demographic is ill-defined, but here's hoping that the anime community will be able to appreciate it just for that. Recommended Audience: Older children should enjoy this, as should many adults and those teenagers who aren't too cynical to stop appreciating such sweet and leisurely films. One could construe the growing affection between the main characters as inappropriate owing to their initial age difference, but it is worth pointing out that even aside from cultural differences, the two only begin to act on their feelings at a point at which they are functionally the same age. There is also a small amount of adult-on-child violence that amounts more to Japanese culture's slightly higher tolerance of corporal punishment than legitimate abuse, but although it is clear that upon examination, there is no harm intended, this may offend sensitive viewers.